Spacious, 4 BR Scandinavian-style cabin in exclusive Bear Creek Community. Located less than 1 mile from the Alpine Meadows Ski Area and 1/4 mile from the renowned Five Lakes Trailhead, this 4 BR home provides easy access to incredible outdoor activities. Leave your car behind and walk to a trailhead or bike down the hill to explore Tahoe City and the Lake. A short walk from the cabin is a private, idyllic swimming pond with a beach and grassy play area. Perfect for swimming, playing with children, and relaxing in the sun. Ski lease available starting December or January. We are a family of five (three children ages 5, 7, and 9) currently living in Massachusetts. Our work has taken us to many places in the United States and abroad, but we always crave the beauty and peace that we find when staying at our Alpine Meadows home. In my youth, I spent summers swimming and playing in the sand at the Bear Creek pond, riding my bike down to Tahoe City and the lake, fishing the Truckee River, and hiking the nearby trails. In winter, I spent weekends on the slopes at Alpine Meadows Ski Area. Bear Creek has a special place in my heart and it was a great pleasure to share it with my husband. He quickly fell in love with Bear Creek and we decided to buy a home there. We love our home because it is comfortable and has beautiful views. It has a large open living area and a good sized deck that easily accommodate a crowd. The tall windows in the living room offer great views of the large surrounding trees and you can watch the sunset on a nearby mountain ridge from the hot tub. The history is also interesting as the home was built by one of the founders of the Alpine Meadows Ski Area and was one of the first homes to be built in the area. We've been told that two Norwegian men lived in a small hut on the adjacent property while they built our home. On the first floor, there is a full bath (tub/shower, toilet, sink) located between the two bedrooms. In the larger downstairs bedroom, there is a sink and toilet. On the second floor, there is a full bath. Great space for big family, very kid and dog friendly. Comfy beds and kitchen stocked with anything you need to cook for your crew. Especially loved the over-sized dining table where we spent most of our time socializing and playing games/puzzles while in the house! The neighborhood is beautiful and very conveniently located. Would love to stay again! This is a wonderful property, a gorgeous area and is much larger than the pictures present it to be. The nearby pond and easy walking area make for a wonderful morning stroll. We brought 2 dogs and 6 adults, at no time did we feel cramped or over crowded. Easy access to Olympic Village and North Tahoe, less than 15 minutes drive, made trips through the area quick and simple. We all thoroughly enjoyed the property and would recommend it to larger families looking for a central location. Clean and very spacious. My overall experience was amazing and again can’t say enough. Amazing place and everything was close also like river rafting,hiking trails,bicycling etc. the caving was very clean and spacious for my family. I can’t say enough about this place and most likely I will comeback again. Just wanted to take a moment to thank the owners for the opportunity to rent this house! It was truly wonderful! We could not have wished for a better place to stay. The house is amazing and they did a great job making sure that it is cozy yet stocked with everything and anything one might need during a getaway. A couple of highlights: THIS IS THE FIRST TIME WHEN PICTURES TRULY REPRESENT THE SIZE AND AMENITIES OF THE HOUSE. The all-around sitting in the living room is a treat. Closet stocked with games for adults, kids and even pets is a gem. Instructions are super clear, getting there and around the area is easy even in winter. Thank you for making the process so easy too and for always being available. Happy New Year to you and your family! 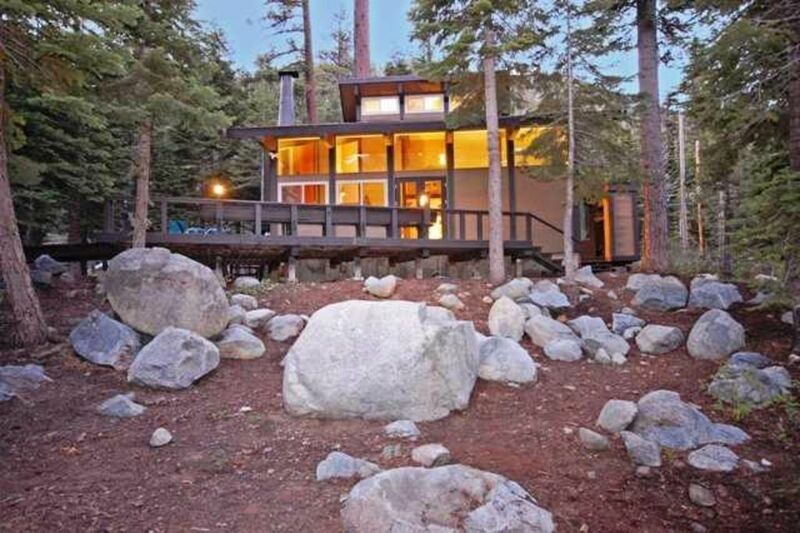 Fabulous cabin for multiple family/group to enjoy Tahoe year round. We went to Tahoe with our two children and another family with two children and the cabin was large enough to accommodate and comfortably sleep everyone. The beds and linens are first rate. The kitchen has been recently renovated and is well stocked with all that you need to prepare a gourmet meal. The family room is cozy and has a fireplace and offers lovely views of the surrounding pine trees. The cabin also has a hot tub which is a big plus. In addition, the cabin is very conveniently located close to the ski lodge, amazing hiking trails, and a small pond/beach area where our kids enjoyed playing. This is a great rental for those looking for a clean, well maintained, comfortable cabin with all of the amenities of home in one of Tahoe's most desirable locations.